These are the conventional woven Jacquards any they can be easily washed and now need no ironing. 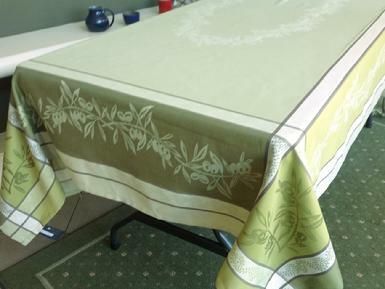 They are very hard wearing yet still have the soft feel of an elegant formal tablecloth. Sizes include: 60x60 and 71x71 square, 60x78, 60x98, 60x118 rectangles. Double clic on photo to expand and see sizes available.